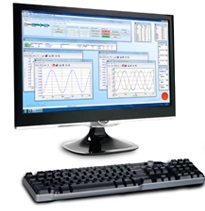 WinTest® controls include advanced WinTest software and PCI control electronics to provide waveform generation, data acquisition, and instrument control in one comprehensive package. WinTest software, which runs on a desktop personal computer under the Windows® 7 environment, features a fully integrated display and user windows that simplify test operations while providing advanced capabilities. ElectroForce® test instruments, by incorporating proprietary linear motion technologies and WinTest controls, provide a revolutionary approach to mechanical fatigue testing and dynamic characterization. Periodic waveforms can be quickly configured for running fatigue tests, and they can be grouped together in blocks to create more complex tests. Advanced waveform features include recreation of real-life profiles and multi-channel synchronization. Snapshot or periodic data collection can be configured in a matter of seconds. Options include timed data, peak/valley capture, level crossing and more. WinTest software and PCI control electronics can be configured to run many dynamic test systems. In addition, WinTest PCI controls support multi-axis simulation, environmental chambers and many types of transducers. WinTest software provides several features designed to better recreate the real-world conditions that are critical for the success of your testing programs. Advanced control capabilities include cross-channel compensation and calculated channels software to provide real-time calculations for measurement channels.